I first came across this report a few days ago. I still can't quite reconcile the madness of the scenario facing a country so recently devastated by super storm Haiyan. Under the Marcos dictatorship, the Philippines took out tens of millions of dollars in loans, much of which was embezzled. These corrupt politicians are then able to relocate to countries that will harbour criminals with money. So first of all, why are there still places like this available in the world? In the digital age, it would be very simple to bring such perpetrators to justice...or at least recover the funds. I would suggest that there is no political will to deal with this. Secondly, if a corrupt government embezzles borrowed money, why is that country paying off the debt and interest for many years after the government changes? This debt is chewing up 20% of national income. A country cannot be expected to develop under this burden. And then Haiyan hits. At the same time as Philippines has received hundreds of millions in aid following Haiyan, they have paid 3 times as much out in debt repayments! The main creditor is the World Bank. This is insane. How can the country ever recover from this disaster when the aid is minuscule compared to the amount that is potentially available if some sense was brought to the debt negotiation table. The Philippines is the most vulnerable nation on earth to hazards, and climate change is massively real for the people living there. 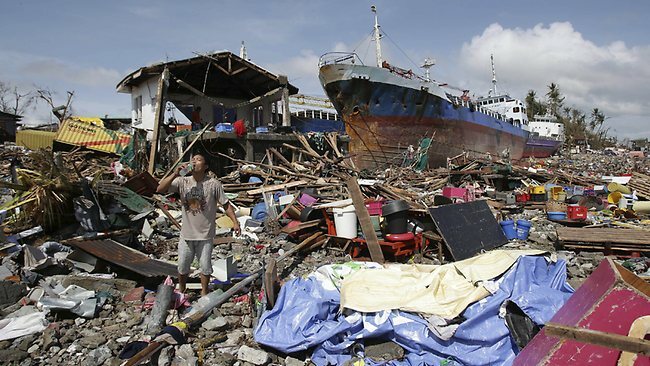 Recovery from Haiyan will take some time, but the next storm will not be far behind. We need to consider the wider causes of such disasters and the potential avenues for change and more sustainable development. Anyone have thoughts on how our global economic systems can change to decrease disaster vulnerability?